So, it’s Mad for Plaid week, but that doesn’t mean we need to ignore dessert, now does it? In my opinion, there aren’t enough plaid foods. 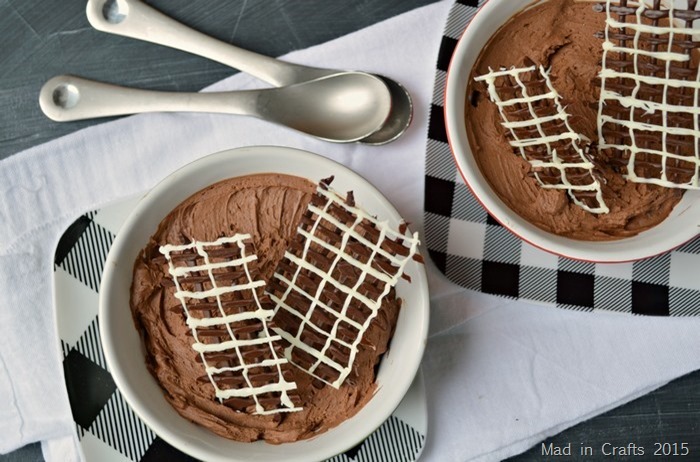 To that end, I decided to share a quick and delicious two ingredient mousse recipe that you can garnish with some chocolate plaid. 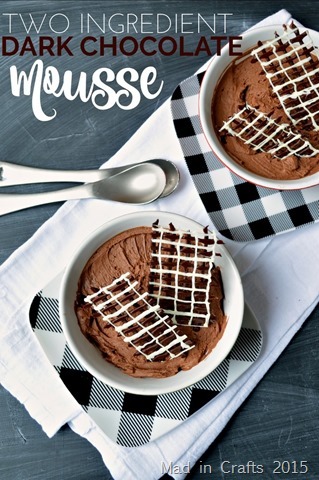 This mousse is made with semi-sweet chocolate chips and International Delight’s Dark Hot Chocolate and it is decadent! 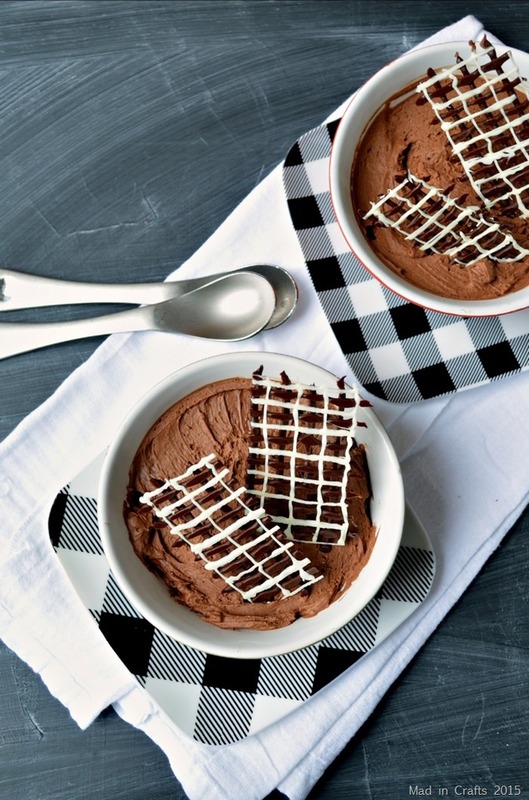 Start out by deciding what size bowls you will serve the chocolate mousse in. The dessert is very rich, so don’t choose anything too big. Then, based on the size of the bowls, determine the size and shape of your chocolate garnish. 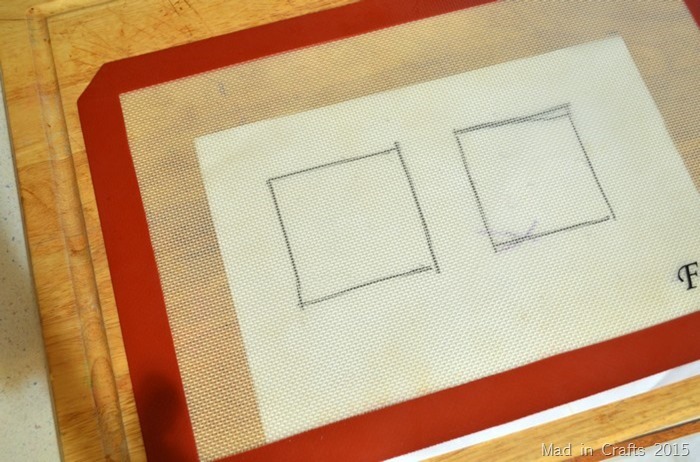 Sketch that shape onto a piece of paper, and slip the paper underneath a silicone mat. You can use that sketch to make sure your chocolate plaid garnish is the right size. Next, melt some white chocolate and scoop it into a piping bag. Cut a very small opening at the tip of the bag so that you can pipe fine lines with the white chocolate. 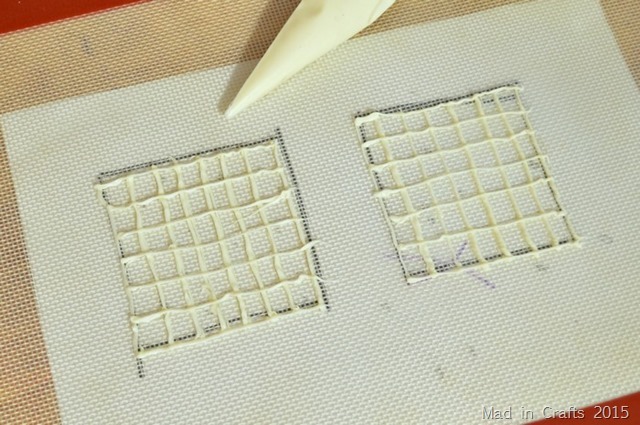 Use your sketch as your guide to create a plaid grid on the silicone mat. Repeat for as many garnishes as you will need. Let the chocolate harden slightly; it won’t take long. Next, melt some dark chocolate chips, scoop them into a piping bag, and snip the tip of the bag. 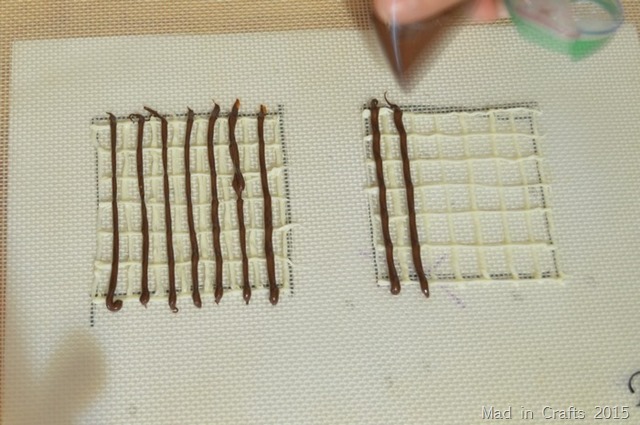 Create plaid lines in between the lines of the white chocolate, going both vertically and horizontally. Then carefully place the silicone mat in the freezer until you are ready to serve dessert. Making the mousse itself is actually very simple. You just need to prepare your two stations before you start cooking. Make sure your double boiler (or your jury rigged version of a double boiler) is set to go on the stovetop and prepare an ice bath as well. After that it’s just a matter of melting the chocolate and whipping the melted chocolate and ID hot chocolate together. Easy peasy. There is some fun food science that happens while you are mixing the chocolate and the liquid together. You will be going along whipping up the chocolate and BOOM!, it will change color. It will go from a mixture both the color and consistency of brownie batter to a milk chocolate brown, fluffy mousse. STOP THE BEATER! Your mousse is finished. Quickly transfer the mousse into serving bowls, and pop it in the fridge for at least 2 hours. 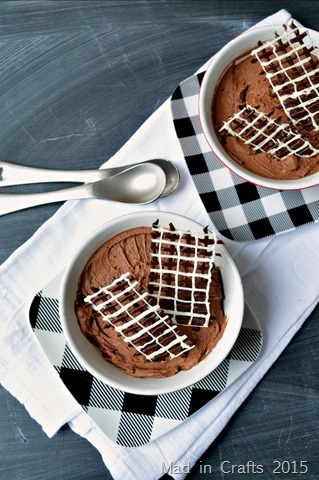 When it is time to serve, take the mousse out of the fridge and the plaid decorations out of the freezer. Peel the silicone mat away from the garnish. Do not try to lift the plaid garnish off of the mat; it will break. If yours break like mine did, make the best of it. Now each bowl of mousse has two garnishes! Position the chocolate garnish on the bowls of mousse so the side that was touching the mat is on top. That side will be smoother and more attractive than the other side. Be sure to visit InternationalDelight.com to share how ID helps you capture the spirit of the season AND for a chance to win a holiday brunch for your friends and family hosted by International Delight! 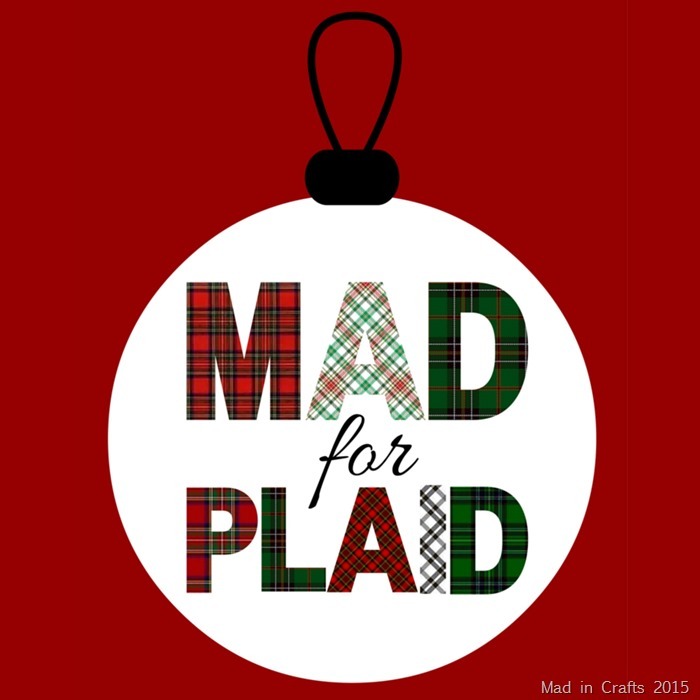 Check back tomorrow for another Mad for Plaid tutorial. Today you should visit The Frugal Homemaker and Just JP to see what plaid DIYs they have come up with! Place bowl of melted chocolate into prepared ice bath. Add ID Hot Chocolate and mix with electric mixer until the chocolate mixture thickens and becomes lighter in color. Pour into small serving bowls or ramekins. Garnish with chocolate plaid, if desired.